Each pack of 14 cards contains different heroes featured in the Vax Pack Hero online game. Set 1 includes Maurice Hilleman, whose accomplishments save about 8 million lives each year and 13 other heroes featured in the Vax Pack Hero game. Each set costs $3 per pack plus shipping. Set 2 includes Louis Pasteur, who developed a rabies vaccine and the food safety process called pasteurization, and 13 other heroes featured in the Vax Pack Hero game. Each set costs $3 per pack plus shipping. 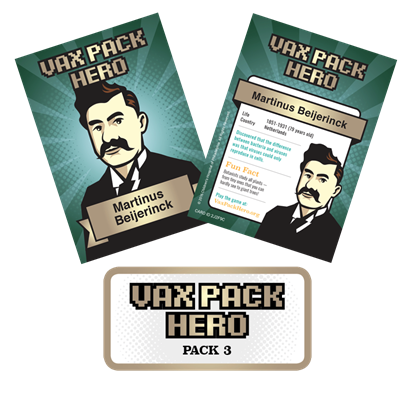 Set 3 includes Martinus Beijerninck, who figured out how to separate viruses and bacteria, and 13 other heroes featured in the Vax Pack Hero game. Each set costs $3 per pack plus shipping. 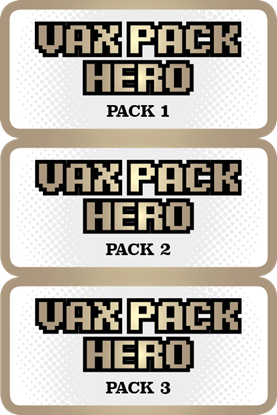 This option includes sets 1, 2, and 3 of the Vax Pack Hero trading cards. Each set contains 14 different cards. The cost is $8 for all three packs (when ordered in a single order) plus shipping. Copyright © 2019 Vaccine Education Center Materials for Parents. All rights reserved.